BRIAN NORTON: Hello and welcome to ATFAQ episode 92. My name is Brian Norton and I’m the host of the show. We are so happy that you’ve taken some time to tune in with us this week. We have a great lineup of AT questions for you today. But before we jump in, we need to take a moment to go around and introduce the folks who are sitting here with me. First is Belva Smith, our vision team lead here at Easter Seals Crossroads. Belva, you want to say hey? BELVA SMITH: Hey, I’m sitting in Josh’s chair and his screen is way bigger than mine. JOSH ANDERSON: I spit a lot, Belva. BELVA SMITH: I’m just like, wow! BRIAN NORTON: That’s right. Next is Josh Anderson, the manager of clinical assistive technology at Easter Seals Crossroads and also the popular host of Assistive Technology Update. Are you doing today? BRIAN NORTON: Doing pretty well, exactly pretty well. Just happy to be here. You’ll notice that there is not someone here today. JOSH ANDERSON: Don’t tell them. BRIAN NORTON: Wade Wingler is not here today. That’s because he is off doing medical technology ID and other kinds of stuff around our building, so he’s not here today. BRIAN NORTON: He walks around throwing his fairy dust and waving his wand. We know what he’s doing. That’s who we have here today appear before we jump into the show, I want to take a moment for those who might be listening for the first time to give them a little bit of information about how our show works. 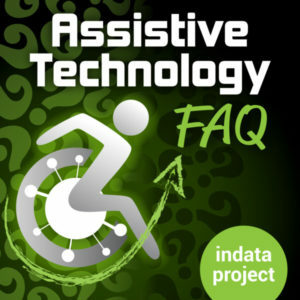 Throughout the week, we receive feedback and come across various assistive technology related questions. We provide a couple of ways for folks to get in touch with the spirit the first being our listener line that is 317-721-7124. We also have an email address set up that is tech@eastersealscrossroads.org. Or you can send us a tweet with hashtag ATFAQ. We monitor that for questions as well. But also we are interested in not just your questions but in your feedback as well. If, as we go to the question today, you guys have some interesting note or something to throw in to the conversation, please send that to us. You can get in touch with us with those very same ways, the listener line, that email address, or the Twitter hashtag set up. We would love to hear from you. In fact, before we jump into the questions that we have today, before the holidays — so we are just getting started with the new year here at Easter Seals Crossroads — we were talking about new technology and wanting to hear from you guys about some of the new tech that you might have gotten. We didn’t get a lot of response so we are still interested in that information if you would to send it to us. We thought we might jump into some other technology we received over the holidays just to get back to that question. Belva, you were mentioning that you got something interesting. BELVA SMITH: I got two things. I got the Ring flood camera. I haven’t gone it installed yet. BRIAN NORTON: It’s like a floodlight? BELVA SMITH: Yeah. I’m probably going to wait for spring to do that. We also got the ring security system — pretty impressed with that. I also bought a cheap Wyze camera for myself. Merry Christmas to me. BELVA SMITH: Wi-Fi camera that can pan and has night vision as well. I was telling you about it because I think it would be a good baby monitor for you. I was looking at baby monitors over the weekend and those are outrageous. JOSH ANDERSON: Do you want to know what we use if we have to be outside? We put my wife’s I phone in the bassinet and then FaceTime each other and take my phone out with me. BRIAN NORTON: My neighbors did that. They come across the street to our house and just have a camera positioned at her. BELVA SMITH: Brian, do you use Apple Pay? BRIAN NORTON: I don’t use Apple Pay. I’ve been looking at using that or some sort of mobile play option. BELVA SMITH: I just started using Apple Pay and I love it. As soon as my bank gets it all figured out, we’ll be doing really good. But I have it set up — I actually set up a second account because I didn’t want it to be connected to my primary account. According to the lady at the bank, that’s what a lot of people do. It’s so convenient with your watch. You just double tap your button and hold your arm up to the thing and you’re done. JOSH ANDERSON: That’s all it takes? BRIAN NORTON: Have you set yours up? You are doing that now? BELVA SMITH: I’m doing it. But I found that I have to get a hold of the bank — that’s why I said I have to get them on board. I have to get a hold of them and let them know that I travel the entire state, so when I’m in Hammond Indiana, please allow me to use it. I tried to use it in Hammond and they shut me down. They are watching, which is good to know. But it’s nice because I don’t have to pull out my wallet, pull out my card. I told my watch up and it’s that quick. And very secure, I guess. I’ve been putting it off for a while but I decided at the first of the year that I’m going to do it. BRIAN NORTON: You can do that with your phone, right? You can just wave your phone on top of it? BRIAN NORTON: And tell me, I’ve heard things about the ring security system. Tell me, is that just like any other security? It has window sensors? BELVA SMITH: It doesn’t have the glass breaks, but has those what you call them? BELVA SMITH: Yeah, contact sensors. They’ve got all different varieties of kits that you can get. BRIAN NORTON: Is it connected to a service that it calls the police? BELVA SMITH: It can be but doesn’t have to be. It’s only $10 per month if you want them to monitor. But since I already have the video doorbell, and that is getting uploaded, I’m probably not going to pay them to monitor because it just could you notify me if there’s anything, like any of the doors get contact that is a broken. But even if you do, it’s only $10 per month and that $50 per month. Honestly, I think around here, about $50 per month is about the cheapest you can get. Before $199, it’s an easy set up. Your keypad, your base station, your motion detector, and one contact sensor and one extender, which I guess is kind of important. I also did have two, over the holidays, get the little Wi-Fi extender things for my house because we just have too many things on our Wi-Fi. It just wasn’t getting good reception. JOSH ANDERSON: What kind did you get? Did you get the mesh network once or the plug in extender kind? BELVA SMITH: I just got the plug in extender kind. JOSH ANDERSON: That’s what I have. I like it. BELVA SMITH: I was going to do the mesh, but I couldn’t convince Todd that we need to spend $400. Comcast is our provider. You can go and get three of them and they just plug into the wall outlets for $120, so I got three of them and spread them out throughout the house. It’s made a huge difference for us, huge difference. When I was pulling up the ring video doorbell, if I wasn’t at home, it would take 30 to 60 seconds to load. Now it’s instant. BRIAN NORTON: I’ve got two repeaters in my house just because of how big and expensive — I’m kidding. JOSH ANDERSON: It’s a mansion. BELVA SMITH: My house is not big. BELVA SMITH: Xfi is what I think they’re calling them. BRIAN NORTON: Josh, you are mentioning, although not for Christmas, you did get a gaming system but you haven’t been able to play it yet? JOSH ANDERSON: The wife and I got a PS4 just so we had something to do. We were kind of on maternity and paternity leave for a while. We realized that our baby somehow knows what the controller sounds like. Even if you turn the volume down, as soon as you pick up the controller and it fires up, she will wake up and will want played with and want attention. And then as soon as you put it back down, she falls back asleep. It just continues the process. So I think we’ve put played about 12 to 15 minutes total over the course of 2 1/2 months. Unfortunately. She’ll get a little bit bigger someday so we’ll be able to play it. They get easier, right? BRIAN NORTON: Absolutely. What I got, because I carry adapters for just about everything. I have my laptop, a MacBook Pro, it has a USB C adapter. It seems like now I carry 10 different cables for getting it connected to HDMI, ethernet, VGA, all those things. I got a 10-in-1 deal. Now you can ethernet, you can plug in your VGA, HDMI, and audio output, three USB, also an SD card, all in one for USB-C. I’m excited about that. I have a couple more presentations this week at different places so I’m excited to come with one cable instead of 10 different ones. I’m very excited about that. I would say if you guys, our listeners, if you received something over the holidays, a piece of technology that you are excited about and interested in, please let us know. Give us a call on our listener line that is 217-721-7124. Or email us at tech@eastersealscrossroads.org. We would love to know about that, because it may be something that we want. Before we jump into questions, we did get some feedback. In episode 90, we talked about Alexa and get a voicemail message from David Ward. I’m going to play that for us. BELVA SMITH: Dave is a regular listener. BRIAN NORTON: He is. Let’s play that and we will check it out. SPEAKER: Hello, this is David Ward with the new vision program from goodwill of the valley. I was calling about episode 90 of Assistive Technology Frequently Asked Questions episode. Just offering my experience and feedback as overseeing some grants, about $40-$50,000 in grant money to buy echoes in seniors in the community appear I also work with the blind as an AT instructor. I believe on episode 90 somebody had asked about pushing a button, especially if they had speech challenges getting their words out, or some other impediment connect with that. This has changed over the last years, but I just checked it on my Amazon Echo remote. This isn’t a very well-known feature. There is a microphone button on the remote and there’s also a microphone built into the remote, so you don’t have to be in the same room. If you hold the button down like you would a walkie-talkie, it will record as long as you are holding that button down. And then you can release print that allows you to get a much longer command, or if you have long pauses where the echo would typically — if you were just giving a verbal command — it would cut off because it thinks its silence. You could leave a rather long command doing that and just release the button when you are done. There might be some more Echo remote spirit I know there is a new remote coming out with a keyboard and stuff. They might be opening up to more than just the remote in this arena. There was also a question about phone calling on the Google home and Echo. you guys got that spot on. I just wanted to add they are mostly good at placing calls, not receiving calls. You can do Echo to Echo calling. But there is an additional hardware device for the Amazon Echo called the echo connect, which can plug into a landline, which would allow you to place or receive phone calls over landline. I would also add if you are in the Apple ecosystem, somebody asked about phone calling, that looks like the Apple HomePod can place and receive phone calls if you have an iPhone in that system, kind of like it hands off to an iPad. I thought I would mention those viewpoints. Love the show, guys. Thanks. BRIAN NORTON: Thank you so much for giving us a call and talking about that Echo voice remote. that is something that can’t to be honest with you, I wasn’t aware of. BELVA SMITH: I had no idea that there was a remote for it. JOSH ANDERSON: I was going to say I’ve seen it on Amazon. I never actually used one. It looks like a fire stick remote or something like that. it has a microphone so you can use it. Very cool. it’s good to hear that it actually does work pretty well. BELVA SMITH: I’ll throw out that one of the folks that we do a lot of work with here in our state, I was talking to him about this. He told me that they are working and have created a switch that they can use to activate the microphone, but they haven’t named it and haven’t decided what they’re going to charge for it or how they are going to market it. BELVA SMITH: No, it’s one of the companies we work with. I told him that as soon as he gets it figured out to let us know, because we had talked about it on the show. BRIAN NORTON: That does sound interesting. We could probably talk about it on a few of our shows. JOSH ANDERSON: Maybe we could help name it. BELVA SMITH: He asked me what he should name it. BRIAN NORTON: The Belva? Excellent. Thank you David. I appreciate the feedback. As we go down through the rest of these questions, just let us know if you do have anything to add to what we are talking about, or if you are remembering a question that you guys might have, give us a call. We would love to hear from you. Without further ado, we’re going to jump in and start talking about some of the things we came across this week. BRIAN NORTON: Do you guys have any tips and tricks for questions about Dragon Professional Individual? Tips or tricks for Dragon Professional Individual. BELVA SMITH: Turn the microphone off when you’re done dictating. BRIAN NORTON: That’s a great tip. JOSH ANDERSON: It’s a very good one. BRIAN NORTON: I can’t tell you how many times I sit down, and somebody asks me a question and I keep talking without realizing that I’ve just made a six paragraphs in my document. JOSH ANDERSON: It seems simple, but positioning your microphone correctly is a big one, just making sure that it gets where it can pick up your voice best, just because it’s going to hear you a lot better, pick you up, understand you better. The better it understands you, the more it’s going to learn from you. BRIAN NORTON: And consistently placing it in the same place. JOSH ANDERSON: Exactly. And even consistently using the same microphone to make a difference. Find one you like and get a good position and keep it there. BRIAN NORTON: Table mics. They do a pretty good job of ignoring background noise, but being a table mic, you just simply have to pull up to the workstation the same way you did. You don’t have to mess around with the boom mic that’s coming off your headset or those kinds of things. It becomes easy to position and be consistent with all the time. JOSH ANDERSON: For sure. For some folks using Dragon, putting on a headset and actually adjusting that is going to be a big challenge. Whereas just pulling up and having the microphone sitting there is going to be a lot easier and quicker. BRIAN NORTON: One thing I always talk to folks about, especially — so there are some folks who need Dragon because they can’t get access to a keyboard or mouse. But there’s also the other set of folks who use it just for productivity. They also can use the mouse and keyboard quite well. I always tell people, don’t forget about typing. You can still type while you dictate. If you’re in a dialog box and you might want to press ALT-S or CTRL-O or those kinds of things, don’t try to say, click “file”, click “open”, and use three or four voice commands to be able to open up a dialog box. Just use the Microsoft keystrokes, CTRL-O or CTRL-S or those kinds of things. same thing for some of the Dragon controls. You can turn on and off the microphone by hitting the number pad plus key. Just keep your finger — if you are able to — on the number pad plus key, so that if somebody does come up behind you and asks you a question while you’re dictating, you just click that before you start talking to them and it turns the microphone off. Dictation is great, but if you can use it in conjunction with the keyboard and mouse, I think will be a lot faster and more productive. JOSH ANDERSON: I think of that when it comes to making corrections. How many times have you said “delete that” or something of that sort and it goes back and finds the word “that” and deletes it? While those are really good, sometimes they can be more frustrating than they are worth. Sometimes just get all your dictation out and everything and go back and proofread it later. It can make it easier. BRIAN NORTON: The other text macros are a big timesaver. I create a text macro, like my address, where it will say Brian Norton, blah, blah, all my address information. You thought I was going to give it to you on the air? Just by saying a two or three word phrase, you are putting in lots of text. That’s also a big timesaver for folks and allows for faster input into the computer. I would also say shorter phrases. Don’t try to dictate all the time, like a large paragraph that once. In order to go back and edit that paragraph and make sure a recognized it all correctly, if you got larger pieces of text, that becomes a little bit more laborious and not as easy. If you go ahead and dictate shorter phrases or maybe a sentence at a time, go back and make sure it got the sentence correct before you move on. I think the editing piece becomes a lot easier for folks if you do it that way. BELVA SMITH: It’s just easier on your computer if you do it in shorter phrases, like a paragraph or something at a time. Remember that as you’re talking to your computer is also trying to process. If you don’t have a high, fast processor and lots of RAM, that’s going to take time and cause errors to pop up. And you may have said this, Brian. If you did, I’m sorry. Remember to use your punctuation. That will help speed the process of dictation as well. And to keep a low noise background. It doesn’t have to be perfectly quiet, but you also easily don’t want to be in a noisy room. If you are, that’s going to definitely interfere. JOSH ANDERSON: In looking at this trying to find something I didn’t use, I found something I didn’t start before. Belva, you talk about Dragon using up a lot of your RAM coupling a lot of power. It suggested to turn off your automatic spellchecking just because that will run in the background. Dragon can’t really misspell a word unless you trained it on something weird and taught it to spell it wrong. Otherwise it’s not going to misspell a word, so I have that running the background? BRIAN NORTON: It’s incapable of misspelling words. It can only put words out there that are in its dictionary. Unless you added something to the dictionary that is misspelled. Two other things I’ll make quick mention of. If you are trying to put a keystroke in, like let’s say you need to hit the enter key. You can’t just say enter. In order to get Dragon to recognize a keystroke as a keystroke, you can say press and then the keystrokes. That could be a keystroke combination as well. I know there are some programs, some third-party programs, that require physically a keypress. Sometimes by saying press and whatever the key is, it tricks the computer like it is physically reaching out to your keyboard and pressing a key. Another trick that I’ve used quite often, just in my own Dragon use, is when you use a mouse grid — mouse grid is the way you navigate, or one of the ways you can navigate the computer system using the mouse cursor. You can say mouse grid and a big tic-tac-toe board jumps up onto your screen, and it’s a numbered, 1-2-3 across the top, 4-5-6, 7-8-9 in the different squares that show up. By the process of choosing one of the numbers in those squares, you start to make that tic-tac-toe board much smaller and smaller until you get to where you want to click. Something that I’ve used quite often is if you’re using a window, like a Microsoft Word, where everything stays the same, stays in the same location — so I look at that red X in the top right-hand corner of. If you can use mouse grid, three, three, three, mouse click, it’s going to run right through those, instead of you having to say mouse grid three, waiting for it to get smaller, if you say mousegrid three, three, three three, it’s going to automatically make that very small on top of that X, and you can say mouse click. If you covered some of those combinations for that MouseGrid, it makes clicking on things a lot faster for you as well. BELVA SMITH: One of the things I always tell people when we start to use any kind of voice recognition is think first and speak second. Have an idea of what you’re going to say before you begin to say it, and talk to the computer as though you are talking to somebody sitting next to you. Don’t speak to it one word at a time, and don’t talk so fast that no one can understand you. Talk in a normal pace, try to avoid — this is a big one — try to avoid the um’s and the and’s, because it’s going to get every one of those. I’ve had good luck with teaching people to use Dragon by just having them talk to me. Not necessarily, okay, we’re going to dictate this paragraph. But we are going to turn the microphone on and you’re going to talk to me. The odd thing about that is that they are talking to me and they asked me a question, they aren’t going to say “question mark.” so that kind of comes later. BRIAN NORTON: I do that, don’t I? Excellent. JOSH ANDERSON: Belva, you brought up to very good points. One, think before you talk. That’s probably something that could help us all out daily. BRIAN NORTON: That’s in the Bible. BELVA SMITH: There you go. BRIAN NORTON: One of those golden rules, right? JOSH ANDERSON: The other one with Dragon, just use it, just talk to it. The more you talk to it, the better it will understand you, and the less mistakes it will have. The biggest advice I have when I am working with anyone is to use it, just use it. Just open it up and use it as much as you can. You can let it learn from your old documents and emails and stuff like that, but it really learns best just from you talking to it. BRIAN NORTON: Two things as we think about Dragon a little bit. It’s important, like you said, think before you speak. But then also it’s important to say a few words at a time. Don’t just try to say one word at a time because Dragon does contractual recognition as well. It’s constantly changing what it thinks you said based on the next word or previous word, and it will continue until you pause or have a break. JOSH ANDERSON: In fact, I’ve dictated a sentence and had it change “there” to all three iterations of it. it got it right, but it was fun to watch because it sat there and changed it, like you said, by the context of the sentence. BRIAN NORTON: The other thing — this is something I miss about Dragon. I’ve been doing this a long time, about 20 years. When I first started, I use the Dragon for a solution for a lot of — and I still use it — but is not as user-friendly as it used to be. I used to use DragonDictate as a solution for some folks who had cerebral palsy or for folks that had some difficulty with speech. A lot of times for folks who have CP, there might be the real difficult time saying some of the commands, like “choose” or the hard consonant sounds like the “ch” sound. choose is used throughout Dragon, right? You choose one and choose two. we were able to go into the dictionary and change that to pick one, pick two. I think there is still some of that capability — I’m not sure. Maybe some of my listeners could chime in and let me know. I’m very interested in that. I don’t think it’s as easy as it used to be to go in and change those things. I used to change all those types of commands. Instead of “scratch that” — that was a hard one to make — I might say the race that. I don’t know if that’s necessarily there anymore in the newer software because they give you less ability to go in and edit those commands. Unless potentially if you get some of the professional and you can do some program macros and set of text macros. Maybe that’s a way to make that happen. I would love to hear from someone if that’s still a possibility. BELVA SMITH: What do you guys think, what is your preference of USB microphone or Bluetooth microphone? What’s your preference? BELVA SMITH: USB is my preference too. JOSH ANDERSON: Especially if you’re working with someone who has some severe physical impairment. If Dragon stops working, your microphone is not connected, and that Bluetooth connection is off, you are going to have to wait on someone to help you. Whereas USB, if it is plugged in, it’s going to work. Until that USB port goes bad, which will eventually happen but you have a lot longer than when the Bluetooth drops. BRIAN NORTON: The other side of that coin is with a severe physical impairment, Bluetooth headsets, what you have it on, if it is going to work for you and the computer doesn’t go bad, maybe it’s easier to have a Bluetooth headset because now, once it is on, it is always on. You can go wherever you want, once it gets back in range, it’s going to automatically connect again. I just wonder if being tethered to the computer vs. not tethered is a consideration. JOSH ANDERSON: You are just arguing to argue. JOSH ANDERSON: The table mic. BELVA SMITH: That’s USB. And then you are not tethered and it’s always going to be there, ready to go. BRIAN NORTON: I will say the Speechware, there’s a three-in-one and a six-in-one. those are really good microphones. I’ve been impressed with them. They are expensive but they are really good microphones. Again, maybe there is a tip or trick that you know about Dragon and would like to share that with us, or if there is anything else you would like to add onto this question about tips and tricks, we would love to hear from you as well. Maybe some experiences you guys have had. Please let us know. We would love to hear from you. you can give us a call on our listener line at 317-721-7124. Or send us a name like tech@eastersealscrossroads.org. Or send us a tweet with hashtag ATFAQ. We will keep an eye out for that. Thanks so much. BRIAN NORTON: Our next question is to separate questions but from the same person. This is from Claire. Claire says she’s from across the pond. She says, hi team, do you have any recommendations for noise canceling headphones and how effective they are we in her second question is, also, do you have any suggestions on activating a dark the on a Google Chrome? As the Windows high contrast mode doesn’t seem to work with what she’s using. Many thanks for your great show, a very happy Christmas, peaceful 2019 to all. We are going to talk with the first one first got noise canceling headphones and how effective they are. Thoughts on that? BELVA SMITH: I think the first thing you have to do is decide if you’re looking for an over the ear or in the ear. And then you have to decide, going back to what we are talking about a minute ago, are you going to be tethered to the device or do you need to be free to move about? Do you want wired or wireless? And then lastly, your budget. Literally headphones can go from $20 to hundreds of dollars. BELVA SMITH: Exactly. Once you’ve answered those questions, then you have an idea of what ones you want to start looking at. The one I found that had the best rating — now I’ve never used it but it is an on the ear headset. It’s the AKG N60 NC, found on Amazon, right around $100. BRIAN NORTON: That’s actually pretty inexpensive, to be honest with you. BELVA SMITH: For that in that year, it was the Bose quiet comfort, which seem to be everywhere you look when you start looking for those headphones. JOSH ANDERSON: Those are good considerations. Some folks, over the ear will be annoying for them or push on their head. Some folks, the in ear is just as bad. BELVA SMITH: We had that caller a while back that was looking for headphones, but she wore glasses and she didn’t want them over the ear. BRIAN NORTON: Those are some really nice ones. JOSH ANDERSON: They are really nice. they plug into your device and use it app to block out the different sounds. I know they work really well and have worked well for the folks we’ve use them with to help with concentration. But really important, try them out, if you can Before you buy them. I know that in ear aren’t as easy to try out. You can always use the loan library is for all the states. A lot of times, the over the years and stuff, Best Buy has a lot of them out so you can go in and try them. As far as being tethered and not tethered, most of them will have the option so that you can use Bluetooth if you want, but they also have a micro USB or something that will plug-in so you can connect them to a computer or phone or some sort. If it’s an iDevice, there are probably nine different sizes of adapters you’ll need to get that to function. But at least it gives you that option to use the different kinds. BRIAN NORTON: I get caught up with how effective they are. I guess it depends on your situation and what kind of noise you are trying to block out. I think if I got it correct, Josh, the isolation headsets are the one where you are trying to create a quiet environment. Is that right? JOSH ANDERSON: Just block out everything. From what I understand, the noise canceling headphones will block out the drones, the Lowes. If you are in a room that has an air conditioner that you can always here, it will block out that. But if someone walks by and talks, that’s going to get through a bit. Whereas the isolation is supposed to block out everything. I’ll tell you what, I’ve never used them. I assume it sounds like whenever you hold a shell up to your ear and you can hear the ocean. I assume it just has that sound going on. BRIAN NORTON: When I give tours around our building, we have a couple of audiology booths down on our second floor. I’ll take our tours and we will stick everybody in those booths because that’s kind of what isolation does shake it all sound out. You feel like you are in a vacuum at that point. JOSH ANDERSON: You turn off the lights and leave them there for a while? BRIAN NORTON: Exactly. I lock the doors from the outside. BELVA SMITH: I think this is kind of like glasses, because it’s very individual. my hearing will be different from your hearing. I may think that this is a perfect set of headphones and blocks everything I needed to block, whereas you can put them on and say I’m hearing everything. JOSH ANDERSON: I probably here different pitches and things than you do. Plus it’s what we notice. What might be completely and totally able to be ignored by me might drive Brian crazy. BRIAN NORTON: That happens too much. BELVA SMITH: Definitely the kind of thing where you are going to want to try them out first. JOSH ANDERSON: Especially with the cost of them. I know a couple of the ones we have here, the Bose quiet comfort, but there is another one whose name I can’t remember for the life of me. BRIAN NORTON: It starts with a “P”. JOSH ANDERSON: I thought it started with an “M”. Anyway. I know the Bose ones are $200, $250. Dealers are $60 or $80. A lot of times, when I’m doing an evaluation where this is something that might help the individual, I make sure to bring both of those. If either one will meet their need, definitely go with the one that is less expensive. If you’re buying them for yourself, the same thing, unless you just want it to save Bose on your ear, which is kind of cool too. BRIAN NORTON: If you’re interested in borrowing those, a great way to find out where to borrow them is to see if your local assistive technology act has those available in your loan library. You can do that by going to our website, EasterSealsTech.com/states. If you go there, you can plug in the state you live in and it will pull up the contact information for your local assistive technology act. And then you can give them a call and see if it is something they might have in their loan library. Josh, you mentioned earlier, it could be just a run up to Best Buy. We have a Fry’s Electronics here. Those kinds of places will have them set out and you can play around with them and see if something does work for you. JOSH ANDERSON: Can we broadcast live from Fry’s? That place is fun. BRIAN NORTON: They have too much stuff. I would not do well there. I would spend too much money. They’ve got lots of interesting knickknacks. JOSH ANDERSON: I don’t think we ever answered your questions on recommendations for them. BELVA SMITH: I think always said is go try them. JOSH ANDERSON: There are just so many different — like I said, I’ve had good luck with most of the different ones. But it’s person-to-person. Some folks, the Bose noise canceling headphones do a great job appeared but for some folks, if it’s uncomfortable on their ear or pushes on the top of their head, it’s going to cause more problems than is going to solve. BELVA SMITH: And it’s expensive. BRIAN NORTON: We’ve had those situations before. JOSH ANDERSON: The same thing with the in ear and things like that. If you’re going to go in year, the best luck I’ve had is with those Libratone ones. they do a really good job of the noise canceling. BRIAN NORTON: The second part of Claire’s questions was, do you have any suggestions on activating a dark theme on Google Chrome? Whatever she is using at this point, the Windows high contrast mode doesn’t seem to work with it. I think that gets in the issue, when you are navigating on the web, because webpages have their own colors, sometimes the high contrast display settings to use with Windows doesn’t necessarily bleed over and play inside the web browser environment. Information on Google dark mode and how to turn that on? Personally, I never used Google’s dark mode. They do have one. BELVA SMITH: I’ve used it. BRIAN NORTON: Tell me, what does that look like? Is it just high contrast for your web browser? BELVA SMITH: Your web browser or your email. That’s the way I used to anyway. I don’t think it worked in Word or anything like that. Then you would use the Windows. It’s called the dark theme. For the individual I was using it for, he’s the one that told me I could do it. I kept telling him I couldn’t do it, he’s like yes you can, my friend did it. At that time, I didn’t realize that it had to be — it’s not just part of the chrome. You have to download the theme. To do that, it’s really simple. You just go to the top settings and go under themes and look for the dark mode. For individuals that cannot look at white, it makes surfing the web so much easier. And the thing I like about it is it doesn’t make things disappear. If you try to start messing with the high contrast settings within Windows, and then you go onto a webpage, you’re going to see that the checkbox is that you need to get to or the edit boxes, you can’t see them. They are just not visible. But I didn’t have that problem with this. I think Mozilla also has a dark mode. BELVA SMITH: I don’t think Edge does. JOSH ANDERSON: I think it does. But I think it’s kind of in the Windows settings. Windows 10, some of the settings are kind of hidden. It is in the settings for edge. I think it does have it. I would be lying if I said I used edge a lot. I have not really used it. BRIAN NORTON: I kind of stay away from edge a lot. It causes more problems. BELVA SMITH: I will tell you guys, I stayed away from edge for a long time, but it’s come to the point where I can’t stay away from it any longer. It’s kind of like Windows 10. I stayed away as long as I could, but it’s come to the point where I can’t stay wait any longer. JOSH ANDERSON: You almost have to if you use a Windows computer. You have to use edge or Google Chrome or something of that sort. Unless you go change all your presets, a lot of things open in edge, from PDF to tons of other stuff. BRIAN NORTON: You can change that, change your presets, right? JOSH ANDERSON: Oh yeah. That part is not that hard. That’s easy to get to. I’ve used the Google dark mode. What I haven’t used, it does it work in Docs and all those? BELVA SMITH: That’s what I’m saying. I don’t think it does. JOSH ANDERSON: Google docs? If you are online? I would assume it would have to work in those. I know in the Microsoft office, at least the new ones, you can enable dark mode through office and have it come through all of them as well. You don’t have to do it in the settings of the computer. I think you can do it with an office. JOSH ANDERSON: The visited links show up almost as a purple, don’t they? And the purple on the black — I have a hard time making it out. BRIAN NORTON: That’s interesting. It’s funny to me — or interesting to me that all these things are now so built into products. Josh, you are mentioning it available within Office products and now we have it available within Google Chrome and all these other places. Whereas it used to be a setting down in your control panel under display settings. JOSH ANDERSON: Or under accessibility. BRIAN NORTON: Now it is all individualized to the program. That’s just so interesting to me that it’s now becoming more — I guess as people age, that’s an important thing for people with vision impairments, right? BELVA SMITH: Absolutely. The good thing is, if you download it and install it and it doesn’t work, or you don’t like it, you can go back to the normal setting or the reverse to the previous setting with a click of the button. It’s not hard to go back. JOSH ANDERSON: I’ve had folks I worked with, they wanted to use it on their baking site or this site. But on most of the Internet, it didn’t bother them at all. It was just certain size they had a hard time accessing, even with magnification. Enabling that dark mode made it a lot easier. Or if it’s something they are on a lot, caused a lot of eyestrain, they would use it, whereas the sites they are just browsing really quick, they can click it off. BELVA SMITH: I’ve had situations like that. I had an older gentleman that his banking website was the only website that he wanted the colors to be darkened. What we did is we got everything configured the way that he liked it. I saved that as a shortcut, so when he was going to go to his banking website that he would just click on it on the desktop and it would have his dark settings. But then when he wanted to go through his other browsing, he just opened the browser normally. So he had it both ways. BRIAN NORTON: That’s cool. That’s great. BELVA SMITH: It’s kind of a workaround for what you could do with ZoomText, where you can have specific programs, application settings. JOSH ANDERSON: In fact, that’s what it was. The person I was working with used ZoomText, but for some reason, if you use the settings in ZoomText, it messed up the website. BELVA SMITH: Oh yeah. That’s common. JOSH ANDERSON: There were little things you couldn’t see. But if you used the dark mode through Google Chrome, it was fine. We had to do it that way. That’s what that was. Thanks for reminding me, Belva. We are helping each other today. BRIAN NORTON: Excellent. If you guys have anything that you want to add to our answers to this question about Google dark mode or high contrast in general, please let us know. You can give us a call on our listener line at 317-721-7124. Or send us an email at tech@eastersealscrossroads.org. BRIAN NORTON: The next section of our show today is our app showdown. That’s where we take a look at a couple of products that compete — not compete — I don’t know how we want to say it. They are similar products and what they provide for folks. we try to pick them apart a little bit, talk about their differences, how are they the same. Today we are going to look as ZoomText and Windows magnifier. The Windows magnifier in version 10, because that’s been updated with some additional features. We are going to dive in and have a group discussion about the differences between ZoomText and Windows magnifier. Thoughts on that? BELVA SMITH: I will start off by saying that the Windows magnifier is amazing nowadays. BRIAN NORTON: It’s gotten a lot better, hasn’t it? BELVA SMITH: It’s gotten a lot better. Is that the only tool that an individual needs? Probably not, because there are still some things it’s missing. But as far as magnification, you can’t beat it. If you just need to zoom from 2 to 4 times or 2 to 6 times really quickly and back, it’s very fast, very smooth. It doesn’t slow you down on any pages or programs that you are working in. If you’re just trying to get a little zoom, I’m very impressed with Windows magnifier. JOSH ANDERSON: I’ve tried, even with folks that you ZoomText, to try to use them how to use magnifier. Especially if there are using someone else’s computer. It’s there and they’ll be able to use it. It may not be for working on the computer eight hours a day and using it for magnification, before that quick magnification, if you are at the library working on someone else’s computer, and you need to access something on someone else’s screen, it’s very easy if you just hit the keystroke to turn it on and do it. BELVA SMITH: I think that’s really important for folks that do need magnification. If it’s a Windows PC, it’s a keystroke and you have a magnifier. What is it? I can’t remember the keystroke. If I were a magnifier user, I think it’s control-enter, will turn it on. And then control-plus will zoom it, and control-minus will zoom it out. JOSH ANDERSON: Or is it Windows-plus to turn it on? BRIAN NORTON: Windows key, plus sign, on the keyboard to turn your magnifier on. BELVA SMITH: They you go, okay. Windows-plus. Any Windows PC and you’ve got your magnification. JOSH ANDERSON: And you don’t have to go into settings, accessibility, don’t have to change anything. Just hit that and it’s automatically on. I think if your boss is like, hey, look at this on my computer, or we need to go over this. Or one of your colleagues, if you’re in a meeting, they have a Windows computer, just hit that and you are in. You can easily zoom in and magnify. BRIAN NORTON: And it’s free, built in. It’s in your control panel still? BELVA SMITH: It’s under ease of access. But again, you don’t have to go digging for it. Also, even if you are just setting up a PC for the first time, in the bottom left corner is that ease of access icon that will get you to the magnifier. But in comparison to ZoomText, there’s a lot of difference, a lot of differences between the Windows magnifier and ZoomText. ZoomText is basically three versions now, I guess, because you have ZoomText magnifier, the ZoomText magnifier reader, in then you’ve got the ZoomText fusion, which is basically all three: ZoomText magnifier, reader, and JAWS. BRIAN NORTON: I think only at higher levels of magnification does that become an issue. JOSH ANDERSON: That’s where I could see the difference, the difference in the magnification is when I get big. On Windows magnifier, it’s a little pixelated. It does smooth a little bit. Is it worth the price? I’m not sure but we can talk about that later. If that’s the only consideration. BELVA SMITH: Right. ZoomText is also going to offer the web and desktop finder feature, which is very helpful, especially if you’re using a lot of magnification. By a lot of magnification, I’m thinking five times, six times. Is easier to use the finder then it is to pay it back and forth and up and down all across that screen. The focus enhancement is something that I really wish Windows would incorporate. I feel it coming. I don’t feel like it will be too much longer. BRIAN NORTON: Is that the triangle, the red rectangle around stuff? BELVA SMITH: Or whatever color you want it to be. BELVA SMITH: It’s the enhancement that lets you know, hey, this is where the computers focus is at. You might be saying all this other stuff, but the computers focus is right here. I think if you are using a high level of magnification, this is very helpful. ZoomText is going to give you a 1 to 36 times magnification, which hopefully no one has ever tried to use that 36. The Windows magnifier is going to give you want to 16. BRIAN NORTON: I usually tell people if you get to four or five times magnification, start thinking about screen reading. You’ll be a lot faster. BELVA SMITH: I remember way back when it first came here, that was one of the things you and I agreed on. And then of course the ability to do the application or program custom settings with ZoomText is something that you don’t necessarily have with Windows magnifier. JOSH ANDERSON: I think that’s one of the biggest ones, especially if you just have certain ways you need things. BELVA SMITH: Rights. Windows magnifier, three, part of your operating system. What that means is that it’s going to — and does work very well, very smoothly. There is no waiting for it to load. There is no hesitation to get it to happen, because it’s just part of the OS and just works. And the ZoomText magnifier is $399 — is that right, Josh? JOSH ANDERSON: I think it went up. I look it up for you. BELVA SMITH: We are going to say it’s a couple hundred dollars because it somewhere two and five, but I think it’s $399. Features are going to be higher — or not higher, but you’re going to have more features with ZoomText than the free version of Windows magnifier. I have consumers that will honestly use both, because the Windows magnifier is so easy to access — uh-oh, Josh his jumping out of his chair. What? That can’t be right. JOSH ANDERSON: Oh, that’s with the SMA. Never mind. JOSH ANDERSON: It’s $500 now. BELVA SMITH: Is it really? JOSH ANDERSON: For ZoomText magnifier. BELVA SMITH: ZoomText magnifier is $500. That makes the Windows magnifier look a little bit more enticing, I guess. JOSH ANDERSON: To touch on something that you touched on, Belva, it’s $625 with an SMA, which gives you the upgrades at the words. With the built-in magnifier, it’s always going to upgrade. No matter what Windows does to Windows 10, no matter once it gets to version 2.0185, or whatever, it will always upgrade. With ZoomText, it may hit a wall at some. where it does not update with that. BRIAN NORTON: I was going to mention, we have done lots of public access workstations these days. Years ago when we first offering that as a service, like everything about One centers or unemployment offices, libraries, and other kinds of things, we’ve put some universally accessible workstations in there so that if folks with disabilities showed up and wanted to use their services or the computer systems, they would have some computer technologies for them to use. When we first started doing that years ago, we would recommend ZoomText, and we would recommend these third party assistive technology applications. Nowadays, I usually tell people, just you your Windows magnifier. Or use the Windows speech recognition that is built into the computer. Again, the upgrade as you go. But also, for 80 percent of the users, it’s not going to get specific had not going to be too terribly customizable for an individual, but for your average Joe who walks in and wants to get access to your services, it’s built in, always there, always upgraded. They work well enough these days that it’s going to do the job for the most part for just about anybody that walks in. Now if we are working for an individual and they are going to an employment situation and they’ve got some specific thing that they need to do, maybe ZoomText is your answer, because of some of the configurations, like Belva mentioned, application specific settings and some of the more advanced features, as far as where your focus can go and hotspots and other kinds of things around your screen. Again, I would agree with you. The Windows magnifier has changed. BELVA SMITH: I think it’s important to point out that ZoomText isn’t the only player in the game. Dolphin has their supernova magnifying software that has a lot of the same features the ZoomText has, comparable in price. I had not had as much compatibility — is that what I want to say? BELVA SMITH: I’ve had more luck with ZoomText being compatible with third-party programs than I have with the supernova. But very comparable when it comes to the features. That’s another program that’s out there that is Windows 10 compatible and works with most applications. BRIAN NORTON: Our next question is, I have a patient that is essentially blind and the quadriplegic from MS. Her primary goal is to use a computer. A long time ago I did a set of combining dolphin software and DNS, what is Dragon NaturallySpeaking software. it was okay but not great. Does anyone have suggestions for the best way to achieve access on a Windows computer, given the needs? BRIAN NORTON: With those two software. BELVA SMITH: Yeah, with those two software. I will say that I’ve been here for a long time now, and I’ve had probably for people, tops, that have had a similar situation. In each case, we have used the J-Say software to marry the DNS and JAWS, and have been quite successful at doing basic stuff like email and basic web searches, doing some word documents. I actually have one individual of those four that is employed using the software. Recently, I’m understanding one of our coworkers has had some experience using the NVDA and dictation bridge. That’s something I still not done, but he’s done it and has been successful with that. I would say, I would highly recommend the J-Say as the best alternative of the three, just because they have worked — they’ve been working really hard for years to make these two programs work together for these individuals with this kind of a need. There is a lot of shortcuts that you can do. Way back when I first did it, it was like a four day insulation, and everything had to be just in the perfect order in order for it to work together. But they’ve come a long way since those days. The install it now is a lot easier. Just the way the programs all work together seems to be a lot smoother. That would be my recommendation for this individual. JOSH ANDERSON: I know I’ve worked with folks with J-Say and had good luck. Apparently I came in after the three day install. It was much easier. It was still a bit of insulation. I don’t want to say seamlessly — nothing ever works seamlessly — but it works pretty well. A member of our team has had really good luck with dictation bridge. Dictation bridge is a lot like J-Say. It’s free, and open source software that you can download. They will work with NVDA or JAWS. Will also work with Windows speech recognition or Dragon. Just depending on what you’ve got and what you need. If you really think about it, it’s free, NVDA is free, and Windows speech admission is free. BELVA SMITH: That’s what I was getting ready to say. You are talking by the time you put the computer in there, because you do have to — I would recommend that you have a new computer. Don’t try to do this on an old computer. But you are probably talking $2500-$3500 to go with the J say. BRIAN NORTON: Because it’s JAWS professional, that standard, or whatever it is. JAWS professional, Dragon professional, and then you have to have J say sitting between it. It’s an investment. JOSH ANDERSON: Another important thing — I’m not sure it still this way — a used to be when you bought J say, you had to give them your user licenses, just to make sure they had the right version. Or you had to make sure that you told them what version of JAWS and Dragon you had so that they could ensure that they gave you the right kind. BELVA SMITH: They always told me what I had half. Like I remember, we were up on the fourth floor the first time I set it up. I remember sitting in that lab in tears because you mess up one little step and you are going back to start over. Yes, when you purchase J-Say, they tell you to make sure you have a specific build of JAWS and a specific build of Dragon. By the way, don’t update them. Because of the update them, everything will break. And I’ve seen that happen. BRIAN NORTON: Don’t let them break. That becomes a very difficult proposition to be able to fix. BELVA SMITH: I just have to say, that’s a very complicated situation. It’s hard to watch a person who literally can’t get to the control key if they need to and to have the software not perform. It’s really hard. BRIAN NORTON: It’s a situation that, to be honest with you, we don’t see all that often. I would say my 20 something years, probably four or five times. BELVA SMITH: That’s what I’m saying. BELVA SMITH: They give up. BRIAN NORTON: It’s too hard, too difficult, we are not going to try for it or do anything about it. It doesn’t come across all that often, but there are some things out there that can provide the type of access. JOSH ANDERSON: I don’t know if this would be something to consider, and Belva, you probably know more about this than I do because I haven’t used often a lot. Dolphin kind of simplify the computer for you, is that correct? Oh, that’s just Guide? BELVA SMITH: That’s just Guide. Guide is a whole different ballgame. Guide used to have the hands-free version where it was all an overly over Windows and was press one to send an email message, and then you could use Dragon to say sent an email. They’ve discontinued that. BRIAN NORTON: They discontinued guide altogether or just the hands-free? BELVA SMITH: Just the hands-free. Guide is still available, but the hands-free version is gone. When I spoke with them about it, it was because the demand just wasn’t there for it. Trying to stay up-to-date with everything to keep it working, they just forget it. I said, I had a consumer who needed something similar to that and I contacted them. How come? She said, no, I’m sorry, we had to discontinue it. JOSH ANDERSON: That sad because, like you said, it doesn’t come up a lot. I think of guide — if I’m not used to using the computer, guide makes it so user-friendly. JOSH ANDERSON: One to send an email, to to do this. It’s so much simpler. Especially if you are using your voice, if you didn’t have the full robust Windows to try to navigate and get to, I could see how that would be very easy. BRIAN NORTON: I would love to hear from you guys, our listeners. if you have that in a situation where you’ve used this type of program, J-Say, dictation bridge — what was the one way before J-Say? Wasn’t there one before J-Say? Jawbone. Wasn’t it Jawbone? BELVA SMITH: That was before my time. J-Say 3.7 is what they were using when I came along. BRIAN NORTON: If you’ve had some appearance with this type of program where you have a person who has a visual impairment, but also has a mobility impairment, and they are trying to use the computer, and different things that you’ve done to make that work for them, we would love to hear from you. You can give us a call on our listener line at 317-721-7124. Or our email is tech@eastersealscrossroads.org. We would love to hear from you. BRIAN NORTON: This question is our wildcard question. Wade is not here anymore to give us our wildcard question, so I’ve had to step into the gap and come up with some questions. I’m pretty excited about this question today. The question is, I recently read an article about a hotel in Japan that prided itself on its all-robot staff. can you believe that? It had an all robot staff. It said that they were aiming to become the most efficient hotel in the world. But just recently, four years after it opened, they fired half of their robot staff were simply annoying customers in failing to perform simple tasks. It got me to think about the trend these days to replace people with technology in places of business. I think of kiosks in McDonald’s for ordering your food or going to the airport to process your tickets and check in. My question is, what are your thoughts on this trend? Good? Bad? What are your thoughts on that? It’s something that’s there, right? BELVA SMITH: There’s a restaurant – I’m not sure where it sat. I heard it on a podcast, a restaurant that is using robots to flip the burger. BRIAN NORTON: Are you serious? BELVA SMITH: Yeah. There is no human. It’s a robots dropping the fries and flipping burgers. I don’t want to go too deep into this. About 35 years ago, my son’s father, a welder, and he worked in a welding shop where they purchased their first automating welder. All the folks that were 40 and older — because he was still late twenties — was like, oh, you are putting us out of work. That’s what you’re doing, putting us all out of work. It sort of, kind of did. BRIAN NORTON: Took a little while. BELVA SMITH: The advantage she had was that he was the young one, so they took the young one and taught him and made him be the one that could make this one machine that could do the work of five people to function. It’s a real. Unfortunately — it’s in schools. Was that robot guy that we have? JOSH ANDERSON: The telepresence robot. BELVA SMITH: That’s going to school for students when they can’t get to school. It’s in schools, in work, everywhere. We are going to have people in automated driving cars. Our Uber drivers, taxi drivers, what are they going to do? JOSH ANDERSON: First of all, I have a lot of questions. When they lay off the robots, do they have to get unemployment? Do they just turn them off? Do they just say we don’t need to hear anymore? You can go? To answer all the different parts of your question, one, I don’t use the kiosk at Taco Bell or McDonald’s. I don’t like it. BELVA SMITH: I did, and it took longer. JOSH ANDERSON: It does. If you want to pay cash, I still had to talk to the person. It doesn’t really save me any time. I came from the service industry. I used to be a bartender, waiter, and all those things. I don’t think I would want a robot to bring my food or even to cook my food or do those things. BELVA SMITH: I don’t even want to talk to a robot. JOSH ANDERSON: I don’t either. I think we’ve had to do it when you call. Please press one. I didn’t hear you. What did you say? And then you end up cursing at it, and unfortunately it understands those and hangs up on you. In a hotel, I could see where some of it — if Rosie could come in and clean the room and pick up the sheets and stuff like that. I don’t know. I think we are going to see more and more. Belva, you talked about self driving cars. I know there is a big worry in the truck driving industry. that’s a huge industry with a lot of employees that do that. What happens if they make self driving trucks? BELVA SMITH: They already have done that. JOSH ANDERSON: And they have. BELVA SMITH: Who was it? Is it Amazon? Its Amazon that has delivered a truckload of merchandise from one place to another, totally autonomous. JOSH ANDERSON: You are looking at an entire employment group of people that will be completely out of jobs. That’s a big question. We could offend a ton of people by answering this incorrectly. I like technology and the way can help individuals with disabilities perk I like the way some of those things can help. Do we need to make our lives a whole lot easier all the time? Not really. I don’t want a robot to mow my grass. I’ve seen too many movies where a robot with spinning blades is not every good idea. BELVA SMITH: I remember not that long ago, I have a consumer asking me if there was an automatic lawnmower that he could get, because he was blind and couldn’t tell where his yard and it and neighbors began. I was like, no, you’re crazy, they don’t have anything like that point they do. JOSH ANDERSON: I’ve seen them. Now if there were a robot that could pick up dog poop, I would buy that. I would buy two. BRIAN NORTON: I would buy a couple too. JOSH ANDERSON: Exactly. So there is your good idea. It really all comes down to what people want and what the cost of labor will be. If it’s cheaper for business owners to buy robots and have them do it, they will probably do it, unless people quit buying things because of it. Then they’ll go back. JOSH ANDERSON: Until they become self-aware and do it themselves. BRIAN NORTON: Then we are all in trouble. JOSH ANDERSON: If eighties movies tell me anything, this does not end well. BRIAN NORTON: Excellent. Thanks guys. Folks, if you want to send us your questions, we would love to hear from you. Please take a moment and give us a call and use our listener line. That’s 317-721-7124. You can send us a tweet with hashtag ATFAQ. Or email us at tech@eastersealscrossroads.org. We certainly want your questions. We would love your feedback. Anything you guys have to offer to the show, we would love to be able to put it on. Without you, we really don’t have a show. Definitely be a part of it.